Inside the Temple of Tamberlain the party found the remaining villagers slaughtered, over their corpses a Cleric of Morrigan loomed, having enthralled the villagers to attack the bandits and to attempt to break through the holy seals warding the lower levels of the Temple: The Hall of Trials. The party made quick work for the evil cleric and, with the blessing of a surviving priestess of the Allfather, entered the hall of trials. 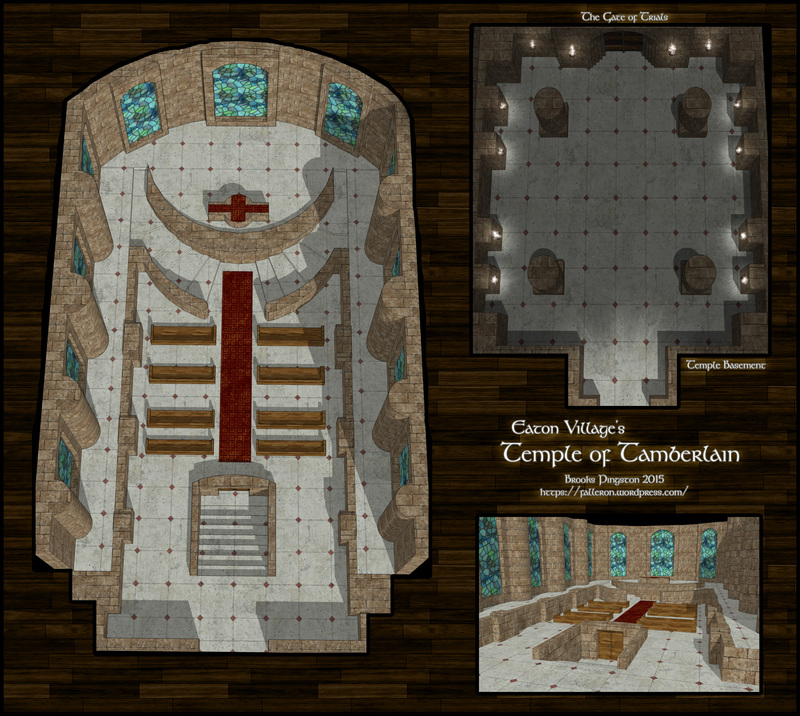 The Chamber of Choice: Here each party member was given a moral delimma by a spirit on the dais in the center of the room (such as having to choose between two loved ones or between family and friends on the battlefield). Based on their choices, they would have one of the four doors open taking them to the Corridor of Consequences. Depending on how “just” their choice was reasoned, the corridor would either have traps or nothing. Then they would find themselves back in the Chamber of Choice for the next player’s attempt. For each player, I had two possible outcomes customized from their backstories and depending on who they failed that person would eventually appear in the Gallery of Grace as an enemy. More on that in a bit. 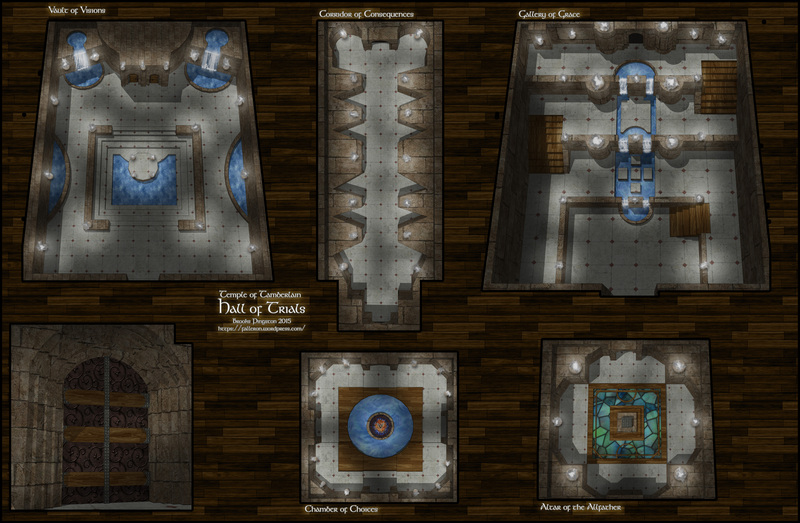 The Corridor of Consequence: Inside I had pendulum scythes, wall spikes, and swinging censers with knockout gas. These traps will be posted over time as part of Trap Tuesday (so keep an eye on the site). In the Vault of Visions I had the players encounter some additional traps, this time a set of ghost-fire walls and a tesla orb, and then later had them make a choice concerning the campaign I’m running with the final two doors. This choice was a big deal in my game (essentially deciding if a supporting character would be good or evil forevermore). After this they pass through the door of their choice and into the Gallery of Grace. Here the spirit from the Chamber of Choice reappeared and told the players “In the words of the allfather, there are no good choices, no bad choices, only what we choose to do and the consequences that follow.” Then the avatar revealed the people the party chose to save in their decision and each granted the party a specific buff, and then revealed those they failed across the gallery for a long battle. After this they entered the Altar chamber and accomplished their goal of passing through the Hall of Trials. I made a lot of traps, art assets, and new tools on this map. I’m excited to use them again!